TCA Ultra Lite composite material in the C7 Corvette coupe. Continental Structural Plastics Holding Corporation of Auburn Hills, Michigan, a subsidiary of Teijin in Japan, recently won an Automotive News Pace Award for the use of its TCA Ultra Lite composite material in the C7 Corvette’s body panels. Pace stands for Premier Automotive Suppliers’ Contribution to Excellence and is an annual award given to companies that have developed innovative technologies that have reached production status. 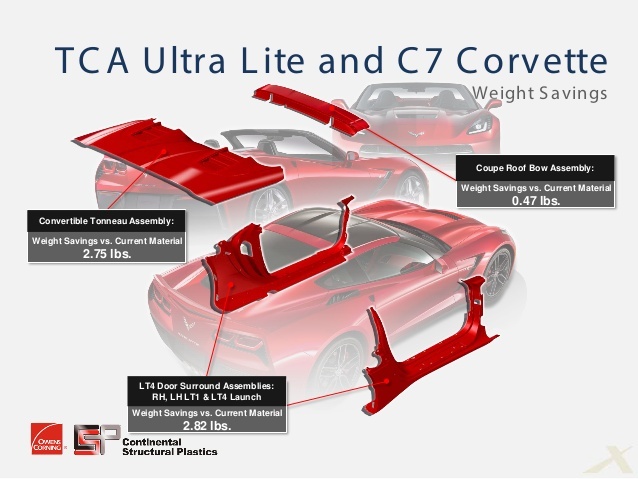 Starting with the 2016 Corvette, the use of TCA Ultra Lite, a Class A body panel material, resulted in a 20 pound weight savings and is the first production use of CSP’s Ultra Lite advanced composite material. CSP’s patented technology makes use of glass bubbles to replace some of the calcium carbonate that is used as a filler in the manufacturing process of the Corvette’s body panels. A total of 21 body panel assemblies including the doors, decklids, quarter panels and fenders make use of this incredible technology. This is just another testament to the Corvette utilizing cutting edge technology to reduce weight and improve performance. TCA Ultra Lite composite material in the C7 Corvette convertible. Previous « Corvette Carbon 65 Edition is Coming for 2018!